I’m delighted to correct a few points from today’s Mail Online article by Eleanor Harding and Tom Witherow. First, the Jean Monnet structure. This is an international mark of distinction for excellence in teaching, awarded to academics the world over who engage in high-quality, innovative and critical teaching. Its objectives “promote excellence in teaching and research in the field of European Union studies worldwide” both on EU issues as well as the study of Europe in its entirety. Jean Monnet scholars are therefore responsible for promoting world-class teaching and research on Europe, objectively and analytically. Not for promoting the EU, or attitudes for or against it. Our goal is pedagogic, not polemic. We teach our students to think, write and speak intelligently on the basis of fact, rather than fiction, using evidence, rather than emotion. Second, our 2017 Blog Competition was open to all our incoming Freshers, and due to its success, Honours students. There was absolutely no pro-EU bias in the conditions. Students were encouraged to write on ANY aspect of European democracy, migration, security, identity, economics or Brexit-EU relations. Of the 12 winners, 4 wrote on Brexit, 3 on European identity, 2 on economic and fiscal matters, 2 on Austria and Spain, and 1 one foreign policy. Hardly a pro-EU outpouring. Indeed, the blogs reflects students’ ideas on the most salient issue of their generation. The awards were therefore made on the basis of insight and appraisal, whatever the student’s attitude to/against Europe. 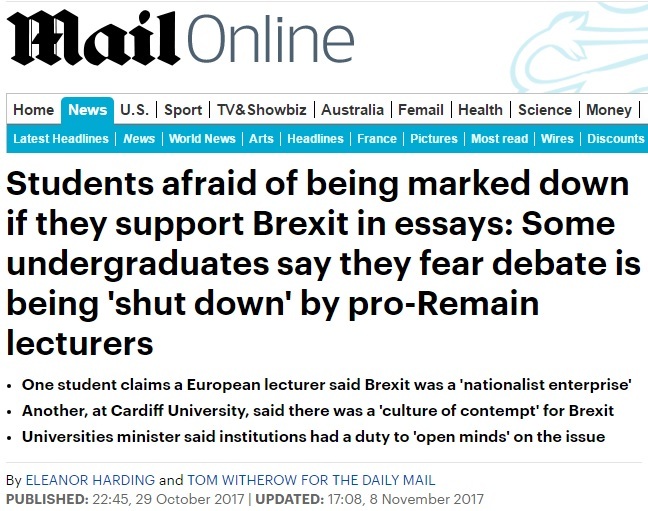 Finally, students have a perfect right, and one enshrined in law, to express their opinion, whether they support or oppose EU integration, or Brexit itself. Jean Monnet structures are a key part of encouraging students to think critically and creatively about future UK-EU relations.